Be still my beating heart. I'm sure some, if not most of you, grew up with the likes of Sailor Moon. I had the manga, the toys, the videotapes, the dolls and the willpower to make this Sailor Moon obsession last until my 20s. Woop! Look at that dedication! However, did you guys know that this year will be Sailor Moon's 20th Anniversary? Although Crystal Neo-Tokyo hasn't come about yet, Sailor Moon's legacy has lasted quite a long time and burned a passion in many people's hearts. 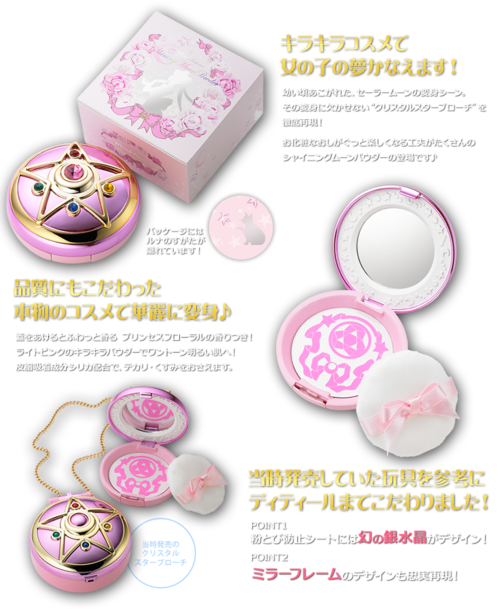 =) To celebrate Bandai has released a collection of Sailor Moon cosmetics inspired by the Sailor Scout's transformational items. 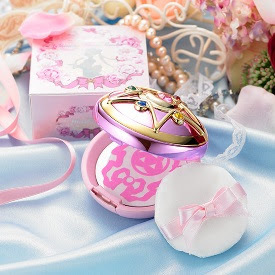 The first release, "Miracle Romance Shining Moon Powder", will retail for $40 dollars and act like a finishing powder. Reportedly, it's lightly scented and will also have oil controlling properties. You can't be shiny, when you're fighting minions of the Negaverse! The preorder is one now, but unfortunately it's only available for consumers in Japan, and will be available for purchase in October 2013. 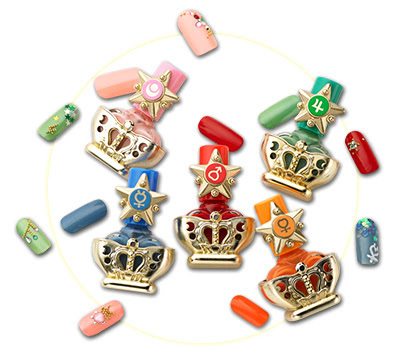 Their second release are these nail polishes inspired by all five of the inner Sailor Scouts and the nail polish bottles are based on their transformational "wands", from the second season. 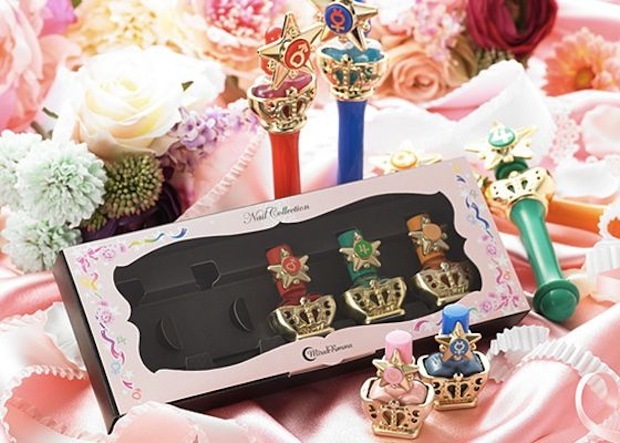 =) Although Sailor Moon didn't have a wand herself, she had the broach above, I think the other nail polishes would be lonely without her. For those of you who aren't familiar with the Sailor Scouts and their colors: Sailor Moon is pink, Sailor Mars is red, Sailor Mercury is Blue, Sailor Jupiter is Green, and Sailor Venus is Orange. The whole set retails for around $53 dollars US and is also on preorder in Japan. The whole collection will come out in October. 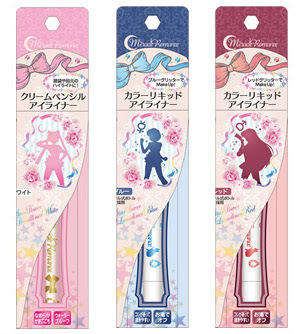 Finally, in a recent announcement, Bandai has added liquid eyeliners to their repertoire of Sailor Moon goodies. Liquid eyeliners that have a "felt tip" like applicator that come in black and brown. Although I'm not a fan of the eyeliner dispersal method, you twist one of the ends to adjust the liquid eyeliner that comes out, the packaging is adorable. 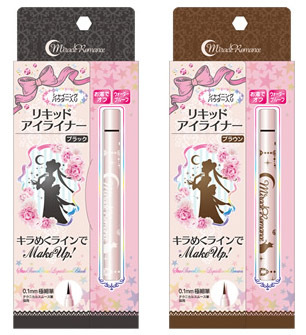 Bandai also has some colored eyeliners that can be used to add color and highlight your eyes. Sailor Moon's pencil on the far left is a shimmery white, Sailor Mercury's pencil is a navy blue, and Sailor Mars' pencil is a burgundy. The black, brown, blue and burgundy eyeliners will retail for around $16 dollars and the white pencil will retail for $10. Aren't you excited? =D Tell me your thoughts! Did you like watching Sailor Moon when you were little? Omg that's so cute and cool. I need this in my life!